Our FAMILY SUITE comprises 2 Bedrooms plus a Family Bathroom. 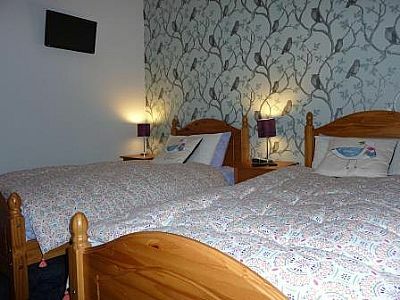 It sleeps UP TO 3 PEOPLE in one TWIN BEDDED room and one additional SINGLE room. When booking, simply choose how many people are coming, and how many beds you need. 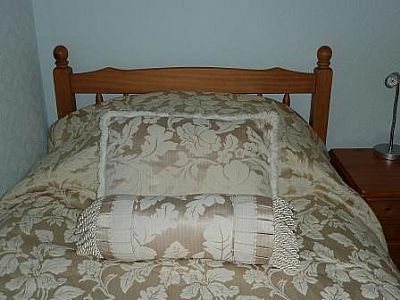 This is THE HAYLOFT - a TWIN BEDDED ROOM - part of our Family Suite. This is THE COACHMAN'S QUARTERS - a SINGLE ROOM - part of our Family Suite. This is our First Floor Family Bathroom - INCLUDED IN our Family Suite. You can choose to relax in a hot bath, or use the over-bath shower if you prefer. 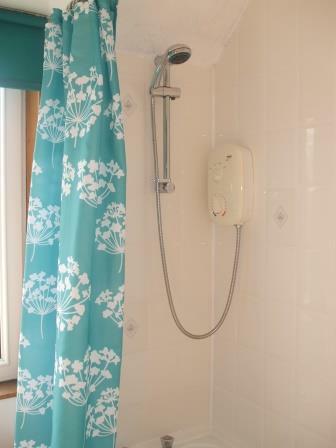 There is a plenty of room to keep your toiletries to hand, and a warm radiator to keep you cosy. Not sure if THE FAMILY SUITE is the right choice for you? Just call us direct on 01478 611 873 for some advice! Take a look at our other rooms by clicking on the photos above.